I posted a quick EnScript yesterday that calculates the entropy of any selected object in EnCase. One of the comments I received asked for more information about what entropy is and what do the values represent. This post is to provide a little more detail about what entropy is and how it can be helpful/useful. Entropy is technically defined here and is the second law of thermodynamics.The technical explanation of entropy in computing terms is described here. Simply put, entropy as it relates to digital information is the measurement of randomness in a given set of values (data). Here is a simple example. Imagine you have a file that is 100 bytes in length and that is filled with the value of zero (0). Using the same formula as above, the result would be one. The closer you get towards truly random data, the closer the entropy value will be to the maximum value of eight, meaning there is no pattern or probability to guess what the next value might be. Entropy can be used is many different way, but quite commonly to detect encryption and compression, since truly random data is not common in typical user data. This is especially true with executables that have purposely been encrypted with a real-time decryption routine. This prevents an AV engine from seeing "inside" the executable as it sits on the disk in order to detect strings or patterns. 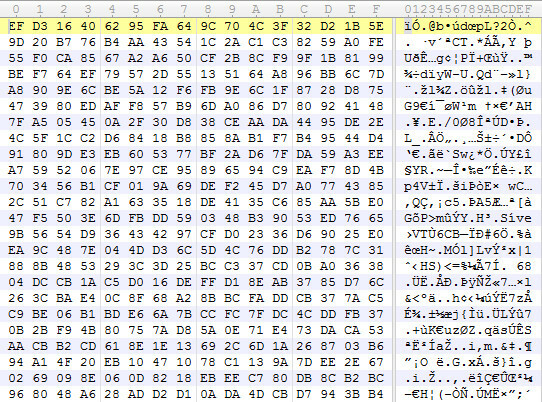 It is also very helpful in identifying files that have a high-amount of randomness (as illustrated above), which could indicate an encrypted container/volume that may go otherwise unnoticed. In the original post, there was some discussion on a forensic message board about using entropy to detect the use of a wiping tool against unallocated space. In that example, you would be looking for repeating patterns that occur over a large area of unallocated. Again, the higher the entropy value, the more random the data, vs. the smaller value which indicates more uniformity of the data.